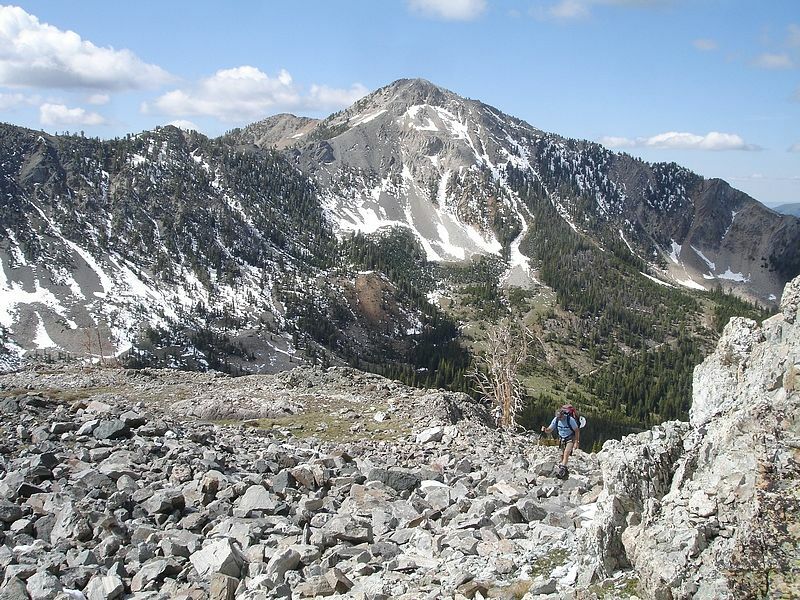 Old Hyndman Peak is located in central Idaho’s Pioneer Mountains. 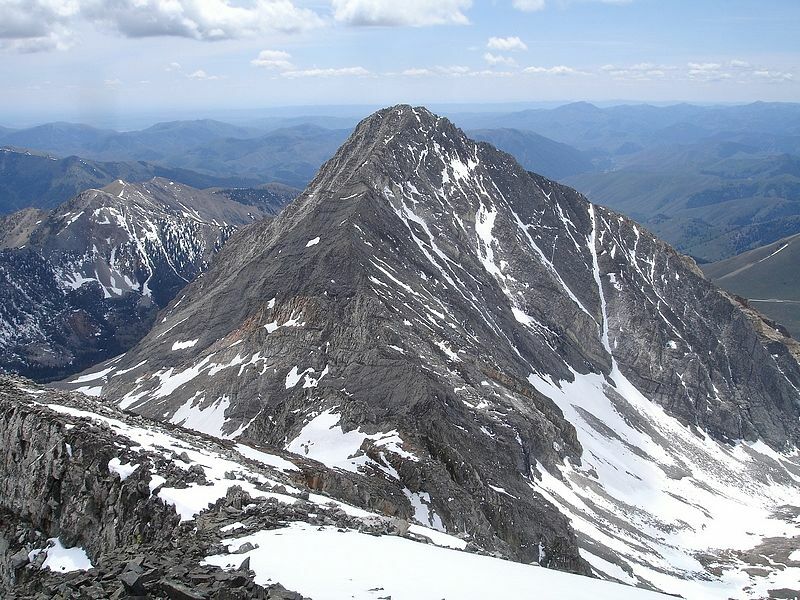 It makes up one of the three legs of the Pioneer Triumvirate along with Hyndman Peak and Cobb Peak. 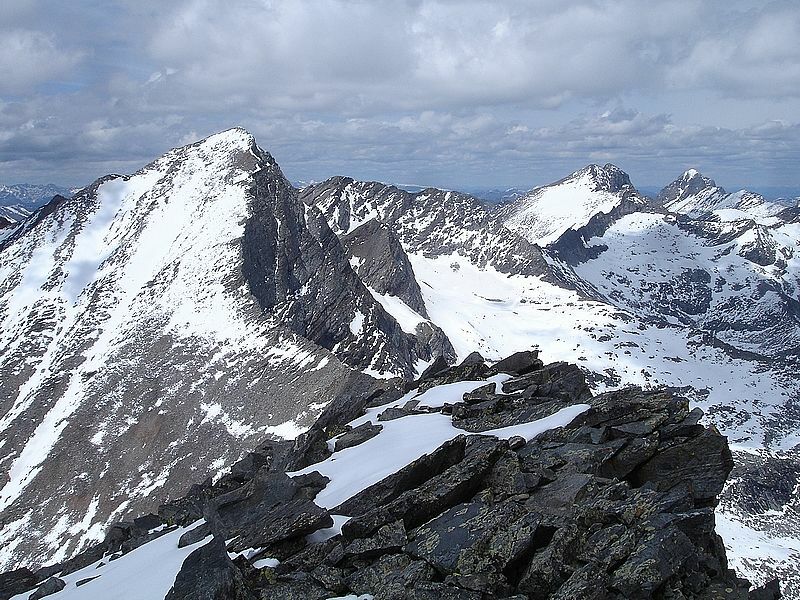 Each of the three in this Triple Crown are awesome peaks, but Old Hyndman is the most unique looking and even bears some resemblance to the famous Matterhorn from some angles. George, John, and I got out of town early, met up with Pat at the Hyndman Creek trailhead, and were hiking by 7:30am on a beautiful crisp morning. The trail is very gradual at first, and winds its way through white bark aspen and meadows soon to be blanketed in wildflowers. After a couple of miles, we got to the fork in the trail. Pat headed left to take on a couloir climb on the north face of Cobb Peak. 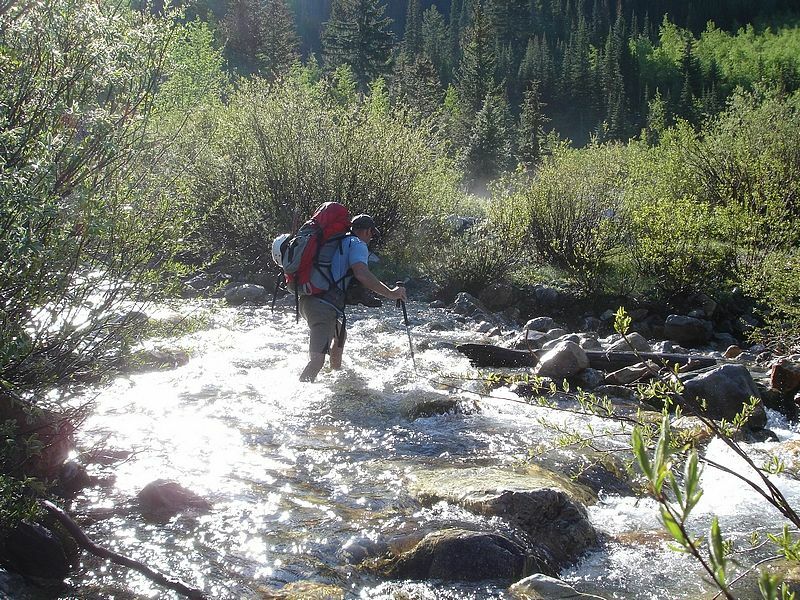 The rest of us crossed the stream, and continued on the trail heading towards Big Basin on our way to Old Hyndman. John had some water shoes with him, and I was very happy that he was willing to toss them back to me after he crossed through the cold creek water. After the crossing, we continued on up the trail, taking in views of Cobb Peak as we hiked. After a couple more miles, we began looking for a way to cross the creek again so we could begin our climb up towards Cobb Lakes, located due south of our destination. The three of us each took a slightly different route, but all ended up in a nice meadow near the Cobb Lakes outlet stream at just below 9000’ elevation. We had gained about 2000 feet in just under 5 miles to get to this point, but now the real climbing would begin. The very bottom part of the climb was through loose talus, but after a couple hundred feet of gain, we found ourselves on good solid rock. It was a fun and welcome change from the loose stuff we’d been on for most of our other climbs this spring. Soon enough we reached the partially frozen lower lake, and then continued to the upper one. The rock in this section was very stable and fun to climb on. 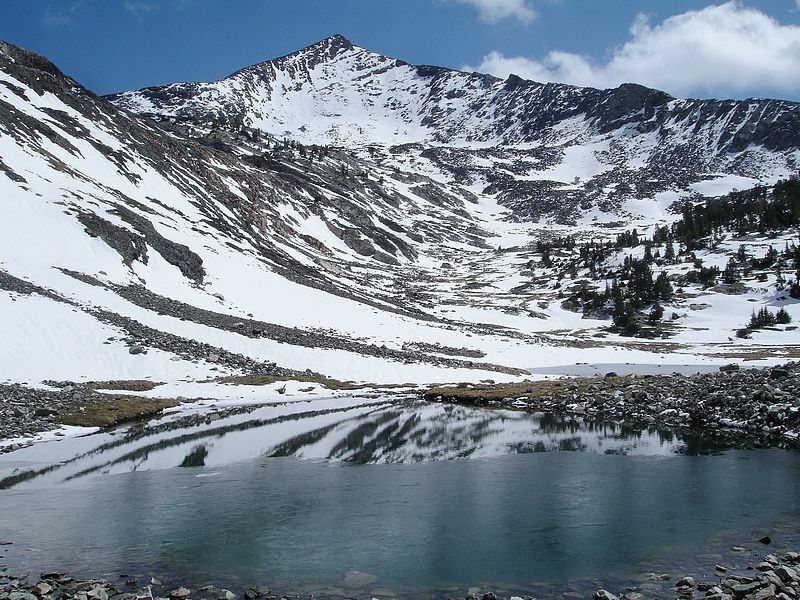 The upper lake was totally frozen over, and the cirque above it was almost entirely covered in snow. 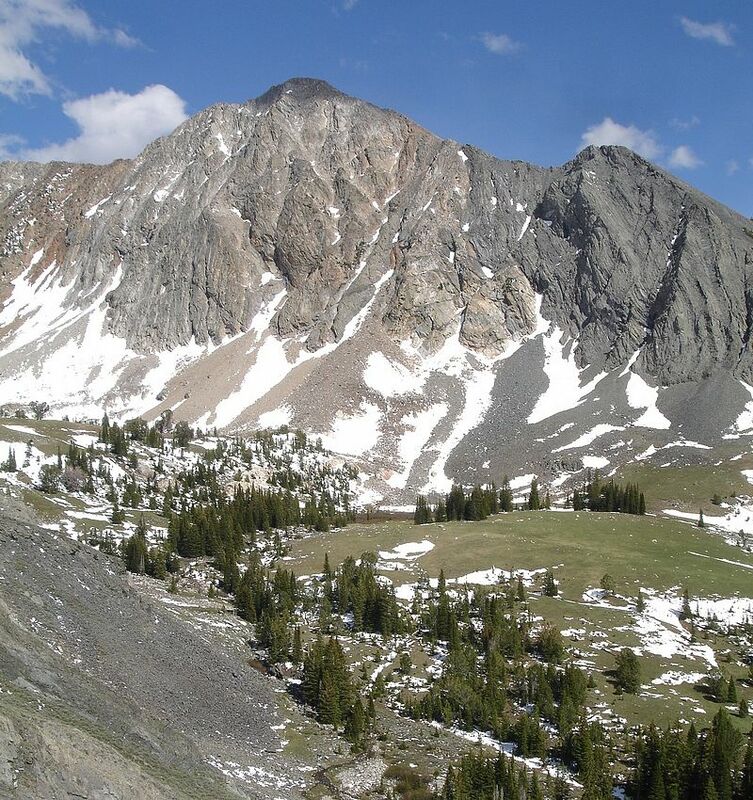 The month of May had been very warm this year, but the Pioneers had just gotten nearly a foot of snow earlier in the week, so conditions weren’t exactly optimal. 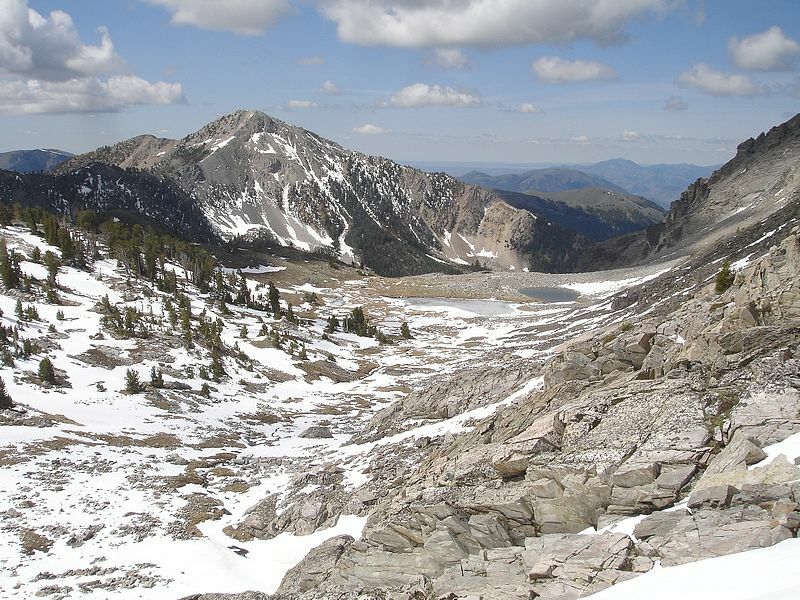 From the upper lake, we headed towards the saddle east of Old Hyndman. On the way, John spotted a mountain goat up on the ridge. We watched it scamper around up there for a while, then continued on our way. The snow wasn’t too bad for the most part, but we still did a little post-holing here and there. 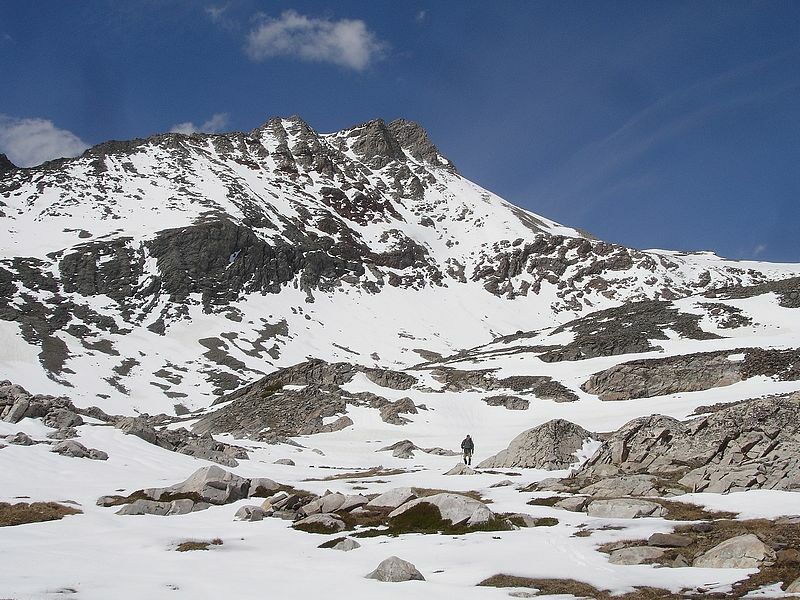 The route began to get steeper at around 10800’ feet, and the snow seemed to get much softer. 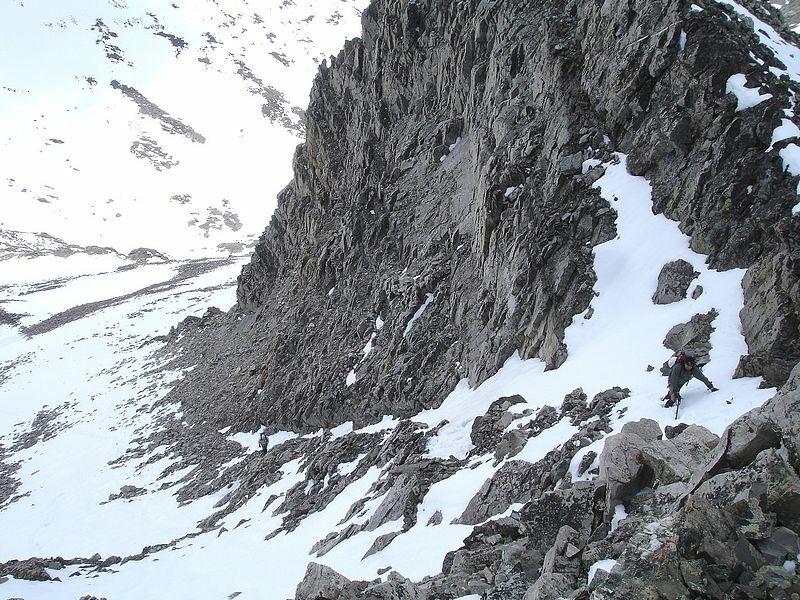 It was tricky going for a while, as we picked our way over and around good sized rocks that were partially covered with snow that wasn’t strong enough to support our weight. The terrain was definitely prime for causing a knee or ankle twist, but we made it through the section without incident. 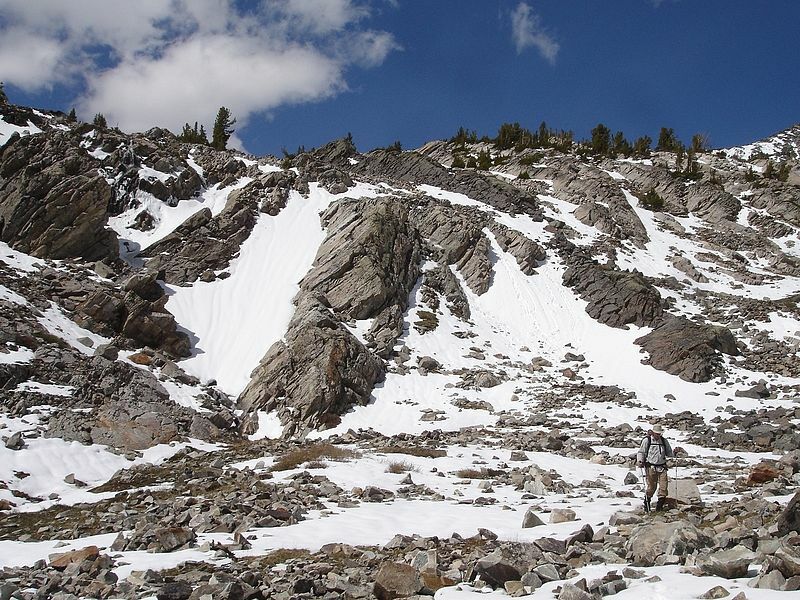 Once above the boulders, the snow became a little patchier along the ridge leading to the summit block. 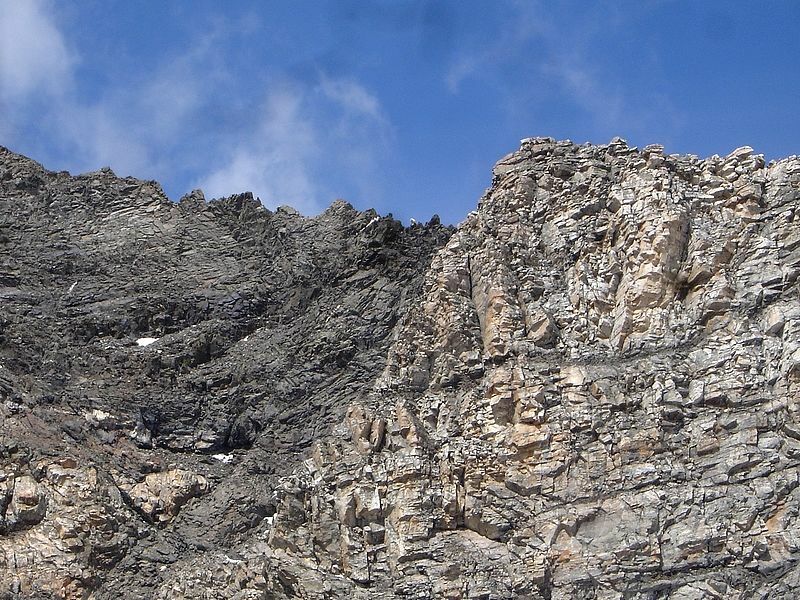 We’d all heard about the “black rock dike” that cuts its way up through and open book gully leading to the summit. But the dark vein was full of snow on this day. We tried to climb it anyway, but the conditions weren’t so good. The recent unconsolidated snow was covering ice that filled the chute. We kind of straddled the edge of the rock on the final stretch to the summit, crossing back and forth from the messy snow and the adjacent steep/loose rock. Once on the summit, we soaked in the views and even spotted Pat on top of Cobb Peak. Based on the looks of the north face, it looked like he probably had quite the climb. We had a bite to eat, soaked in the views, and I thumbed through the summit register looking for any names I might recognize. 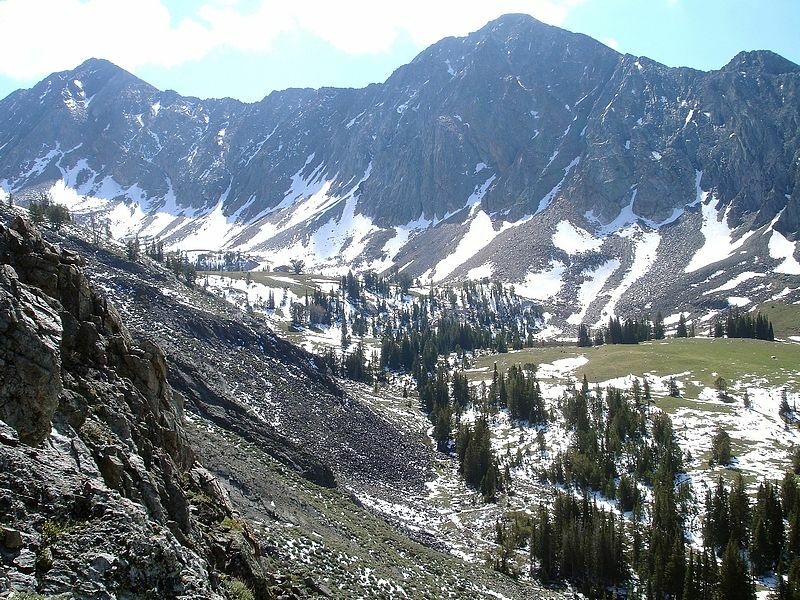 Several of the entries mentioned plans to complete the “triple crown” by summiting all three of the big peaks in one day. Quite an achievement for sure. Throughout the day, us big talkers had been talking about bagging a second peak while we were in the area. 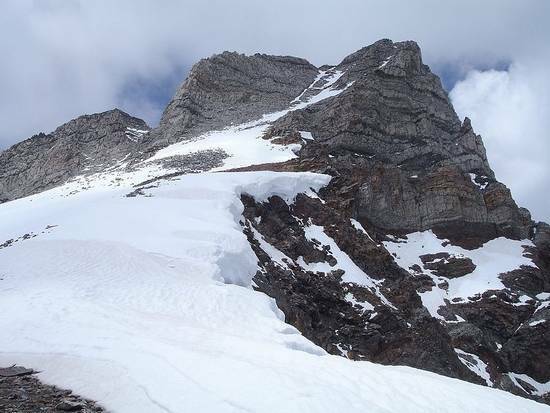 But the conditions had slowed our pace quite a bit and we decided against trying to add another summit. 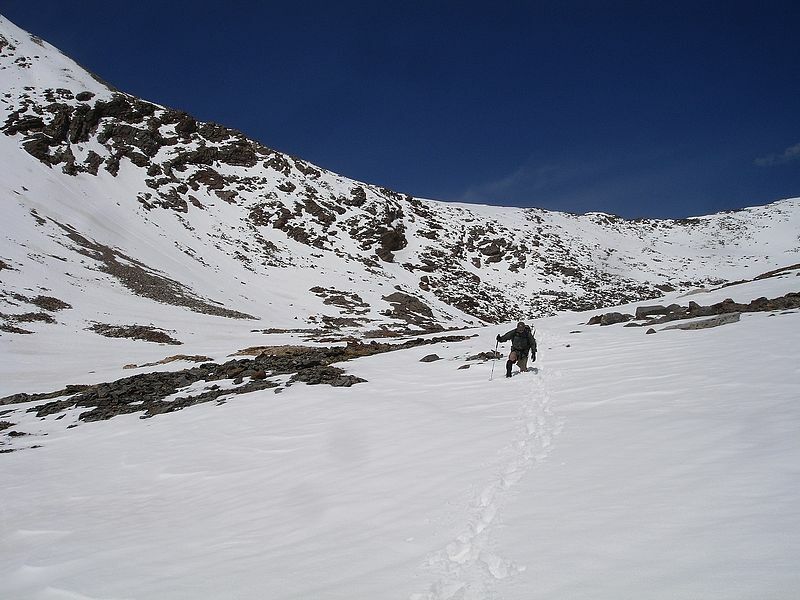 For our descent, we opted to bypass the dike route, and looked for a glissade path that left the ridge further south. George got a head start, and then yelled back to us “just don’t look down”. It looked like a pretty mellow ridge walk, but looks can be deceiving. 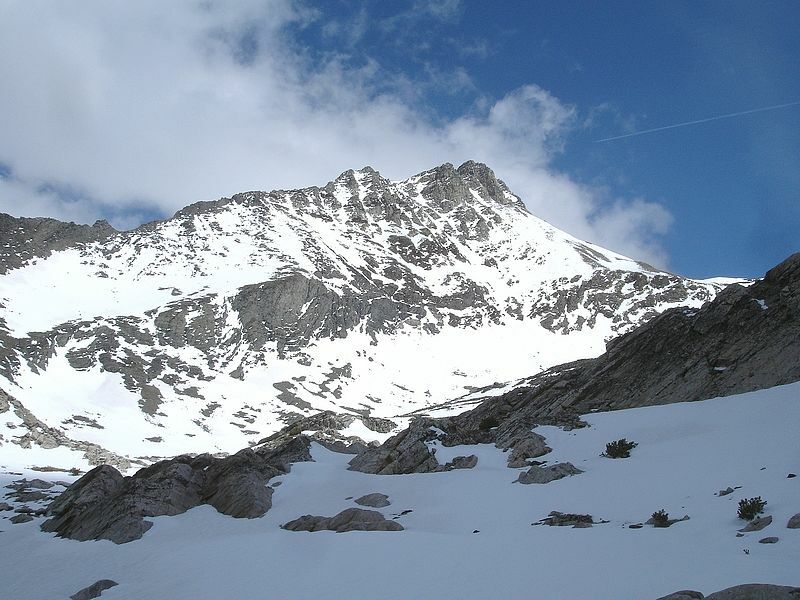 We had to weave around a couple pretty exposed knobs to get to the top of the snow that would eventually take us back down into the cirque above Cobb Lakes. Lots of fun, NOT! When I finally got to the snow, I could see John and George already strolling across the snowfield a thousand feet below. They made a quick glissade, but I wasn’t too experienced in the art of “rock slalom slush glissading”, so it took me a little longer to get to the bottom. From here, we just retraced our route back down. We were all staring to get tired, and the extra post-holing through snow softened by afternoon sunshine sure didn’t help. I think the descent through this portion took even longer than the climb, especially the section of talus-covered hillside just above the point we finally got back to the trail. The boot path was a welcome site, and we made steady pace back down to the trailhead. The only incident was a miscalculated angle on my boot toss at the creek crossing, which resulted me having one wet foot for the last couple miles. It was after 6:30pm by the time we made it back to the trailhead. 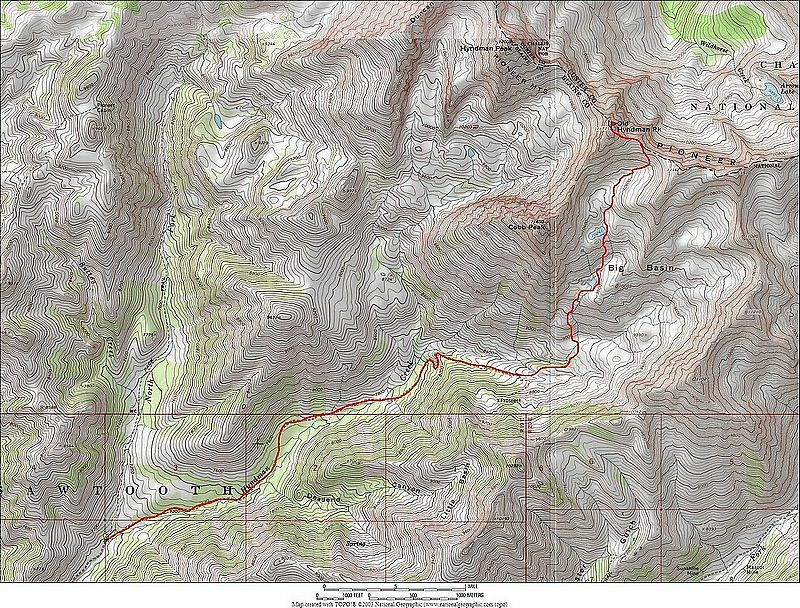 It had taken us 11 hours to cover a little over 14 miles and 4800’ of elevation gain. That doesn’t sound like too good of a pace, but considering the conditions up high, we didn’t feel too bad about it. It had been a long but very satisfying day spent surrounded by fantastic scenery. It was my first time in this area of the Pioneers, but definitely won’t be my last. Overview map of the 14 mile round-trip route. John crossing the creek where the trail splits and heads towards Big Basin. The spot where you leave the trail and begin scrambling. Cobb Peak in the background. McIntyre and Jacqueline Peak above Big Basin. John makings his way through the rocks below the lower Cobb Lake. Lower Cobb Lake (9758') with Point 11442' in the background. Looking back on lower Cobb Lake, confined by a terminal moraine below. 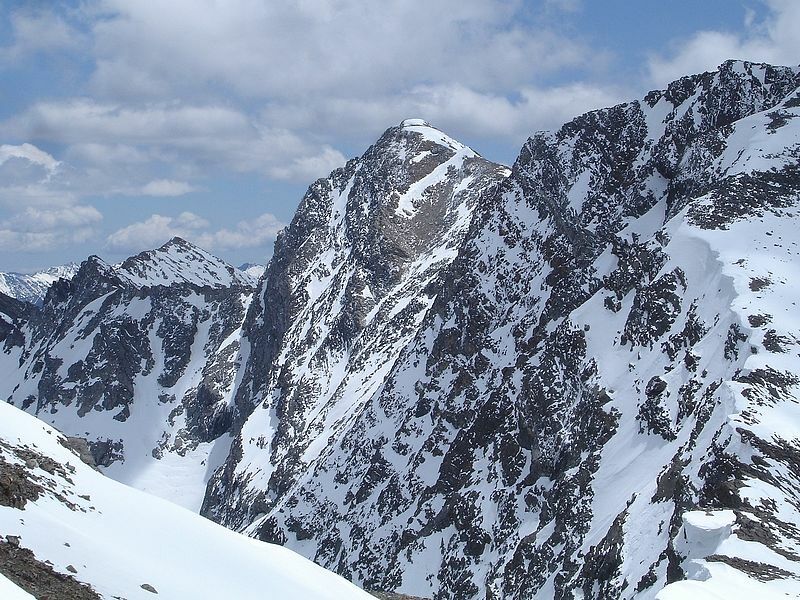 The east face of Cobb Peak. 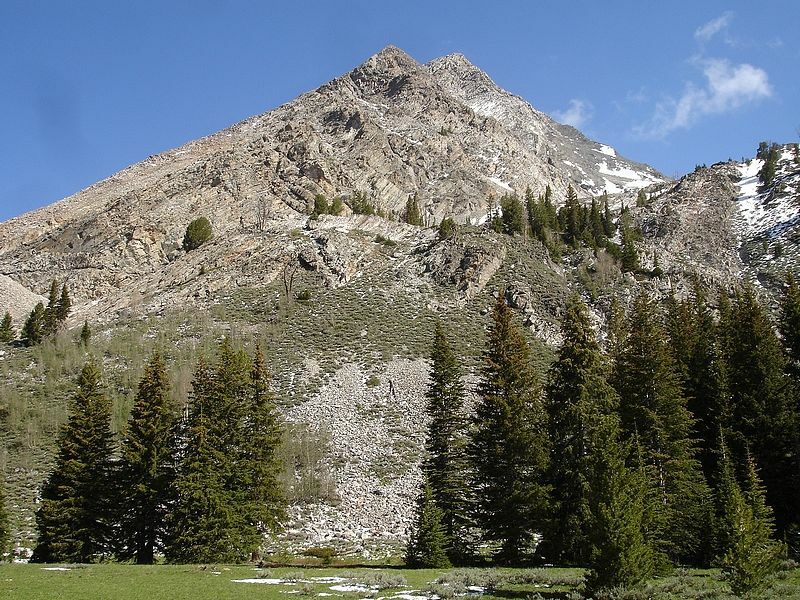 Old Hyndman Peak from the southeast. Close up of a mountain goat on the jagged ridge between Cobb and Old Hyndman. Old Hyndman's cool looking summit block. 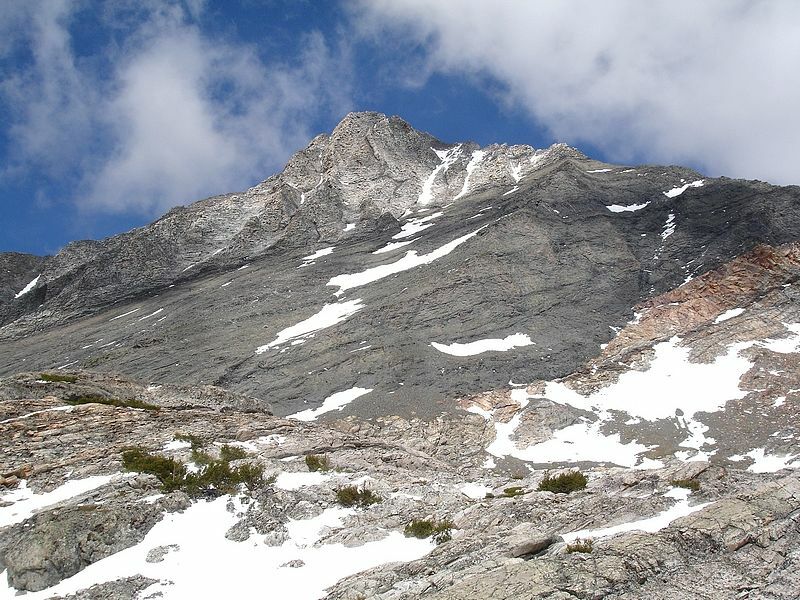 A view of the steep north face of Big Basin Peak, from just below Old Hyndman's summit block. Good shot of George and John nearing the summit. Looking west from the summit of Old Hyndman towards Hyndman Peak, Duncan Ridge, Goat Mountain, & Devils Bedstead East. 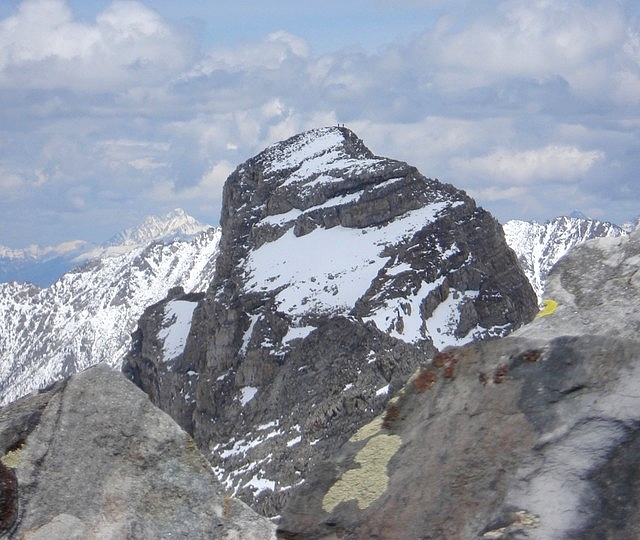 Cobb Peak to the southwest of Old Hyndman. Pat took this great shot of us on top of Old Hyndman from his vantage point on the summit of Cobb Peak. John post-holing across a snowfield on our way back. John with Old Hyndman in the background. George with some waterfalls behind him. One last shot of Big Basin, with Jacqueline Peak towering above.